Water in SVG is too expensive for many families in SVG. Between 2006 and 2010 inclusive an average of 360 households were cut off from mains water supply each month - 21,600 in five years. This is an alarmingly high number. 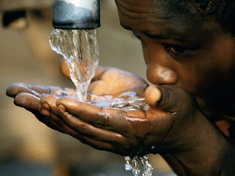 Without clean water, the possibility of breaking out of the cycle of poverty is incredibly slim. With unclean water sources often a long way from people homes, many poor people are forced to spend hours each day simply finding and transporting water. Water is life and every household in SVG should have access to mains water. A Green government will cut the price of water by 50% and make sure every household has water. We will abolish the water meter rental charge too. The first 1,000 gallons used each month will be free. This will help poor households immensely.